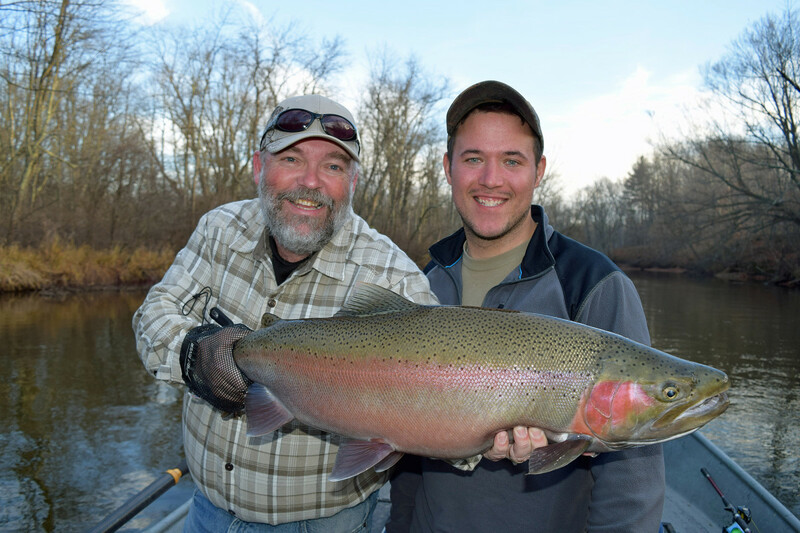 The author (right) and his son with a fat Michigan steelhead. 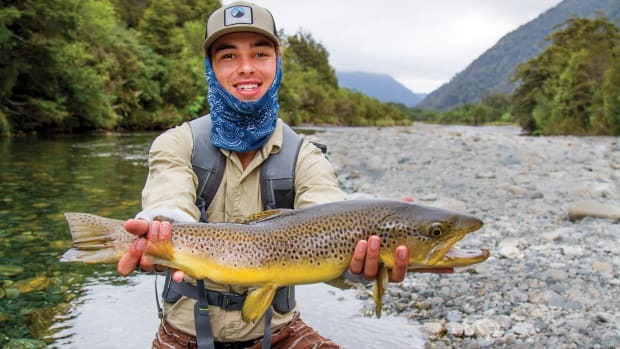 I’ve been an avid angler all my life, including a 15-year stint as a salmon and steelhead guide on Washington streams, which means my son, Kris Jr., was one lucky kid. 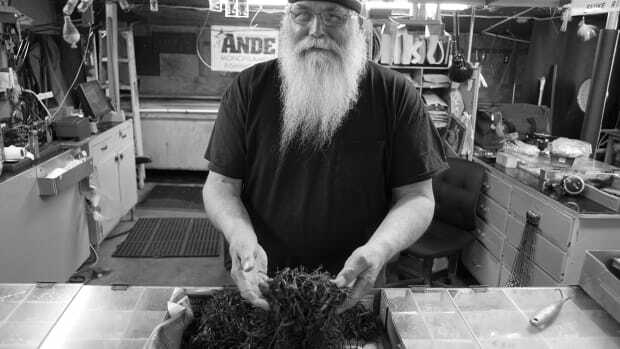 When most youngsters learned how to ride a bike or build model cars, he sat in the front row of a drift boat learning how to back-bounce large clusters of cured salmon roe, waiting for massive chinook to inhale his offering. He learned just how to feed the beast and set the hook at the perfect time to ensure solid hookups. Between my guide buddies and me, he was spoiled with the kind of fishing excursions in most boys’ dreams. Pink salmon invade our home river every other year in numbers that would boggle your mind. When they are in thick, we put on clinics for all those fishing around us. Pinks, also known as “humpies” for the large hump the males develop, are the fish that taught Kris Jr. how to cast light tackle, finesse a jig and let a fish run before working it back to the boat, all at the tender age of 5 or 6. 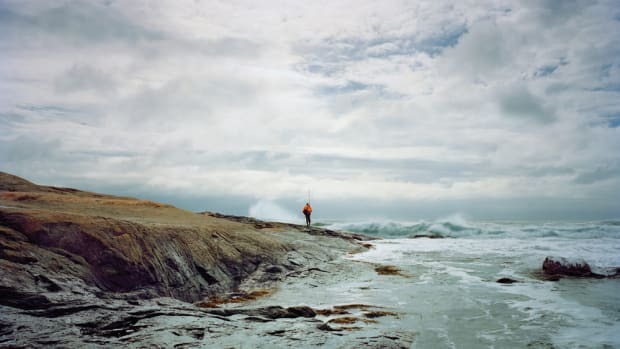 Many recollections of his angling youth have left an indelible impression, but probably none more so than when he landed his first large chinook salmon on his own. We were making a father-son float down Washington’s noted Hoh River in early July 1996. With me handling the oars and him up front setting out the plugs, the magic happened. After a crushing strike, a perfect hook-set and a few sizzling runs that saw us chase that big springer downriver more than 200 yards, I slipped the net under a gorgeous 35-pound hen that his 8-year-old arms could barely lift for a photo. 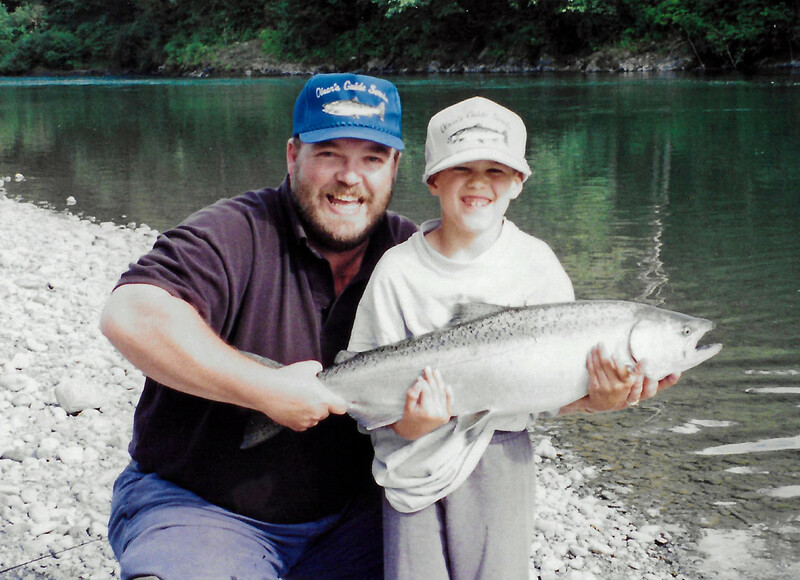 In 2002, just before he turned 15, we spent a great week on the southern part of Alaska’s Kodiak Island fishing for coho in the streams surrounding Olga Bay. We cast spinners to voracious silvers fresh from the bay and wore ourselves completely out. And then when he was 19, Kris Jr. joined a buddy and me for a float down the Sauk River, a tributary of Washington’s Skagit, in search of late native steelhead. He hooked and landed the only fish of the day, a once-in-a-lifetime 25-pound buck that left me (and any steelhead angler) jealous. But then, in early February 2016, we got the news that no parent should ever receive. At age 28, after dealing with health issues and a few trips to specialists, we learned that Kris Jr. had stage IV colorectal cancer. The scans left little doubt as to how far the cancer had progressed. We were all numb as his oncologist gave us the bleak outlook. 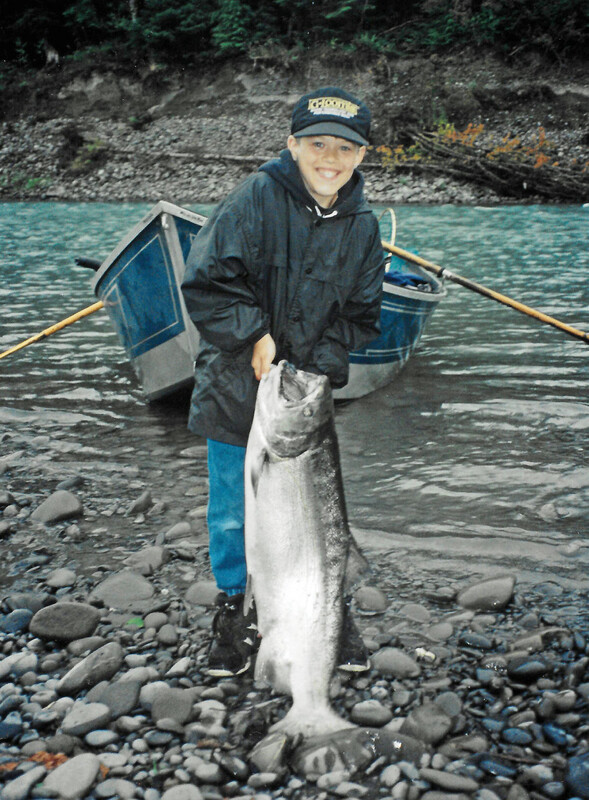 Kris Olsen Jr. with a Hoh River spring chinook, circa 1996. We were in tears, but Kris Jr. was determined to be steadfast and defiant. He began a six-month program of chemotherapy every two weeks, a process that can take a lot out of anyone. He never complained or felt sorry for himself — and we immediately started planning our next father-son fishing extravaganza. We weren’t going to waste one second. We tossed all kinds of venues back and forth — British Columbia, Alaska, fresh water, salt water — and then I remembered a fantastic fishery I had enjoyed several years earlier in Newaygo, Michigan. In 2013 I’d spent five days there with my buddy Tony Rezanow, fishing with Betts Guide Service on three rivers, with excellent results. We fished the Manistee twice, the Muskegon twice and did a one-day raft float down a small, hidden gem of a stream. The fish were as exceptional as those in the Northwest, as they share the same DNA from plants dating from the 1960s. 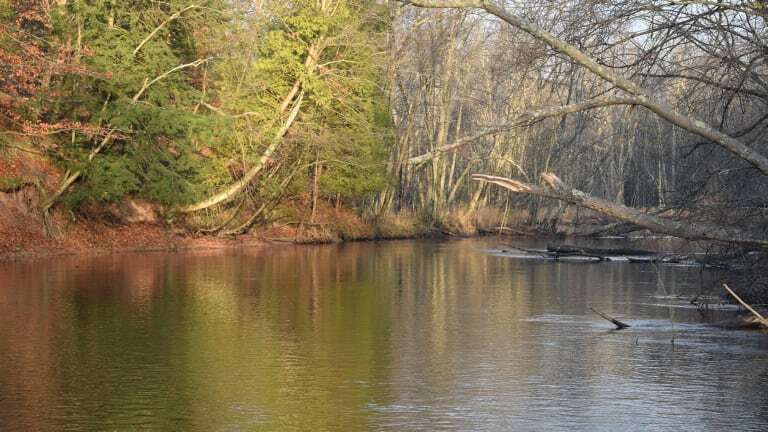 Kris Jr. was all for the idea of chasing big fall steelhead, especially because planning the trip to Newaygo would allow him a chance to visit a different part of the country for the first time. And the timing would be perfect since the best fishing would happen after he finished his chemo and recouped a bit. I called Chad Betts of Betts Guide Service to explain our situation and booked the week of Nov. 14-18, 2016. Airfare from Seattle to Grand Rapids, a rental car, hotel and guide fees (including gratuities) added up to less than $4,000 for both of us — not bad for two avid steelhead anglers living the dream for an entire week. Spring and summer ahead of that trip was kind of a whirlwind. 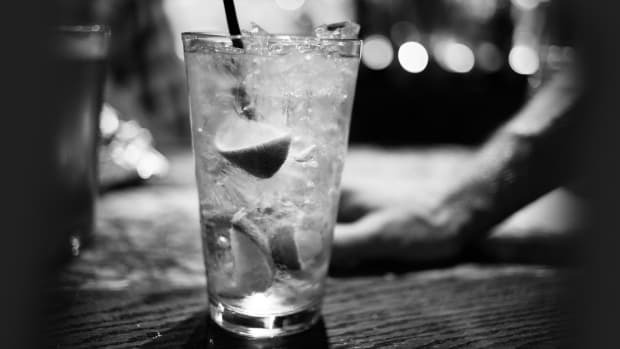 A scan halfway through the chemo process showed that the treatment was working, but all we could do was wait and see how the rest of the treatments performed. Kris Jr. finished his program in August, and a date was set for a scan to check the full results. In early September, under gorgeous blue skies, Kris Jr. and his girlfriend of four years, Angileen, were married in a storybook outdoor wedding. She never hesitated after the diagnosis. After their honeymoon, we all met with the oncologist. The report was nothing short of a miracle, with even the oncologist expressing disbelief: Kris Jr. showed no signs of cancer. Although the long-term outlook remained a mystery, God had given us a reprieve. With that thought in mind, Kris Jr. and I boarded our flight to Grand Rapids. It was early evening by the time we landed and drove an hour north to Harrington Inn in Fremont, Michigan, which would serve as home base. The forecast called for unseasonably mild weather, with afternoon highs in the 50s, a bonus if ever there was one. We met Betts early Monday morning to fish the Muskegon River, which had been loaded with big chrome steelhead during my 2013 expedition. River conditions this time were less than ideal, with low, clear water resulting from a lack of rain. Fresh fish had slowed their migration from Lake Michigan, and although we roto-tilled the runs and fishy-looking pockets, few steelhead found their way to the boat. We ended up going three for four on our first sortie of the week. The following morning we tried a different section of the river, but as a slow morning turned into an even quieter afternoon we were starting to think that maybe this just wasn’t going to be our week. 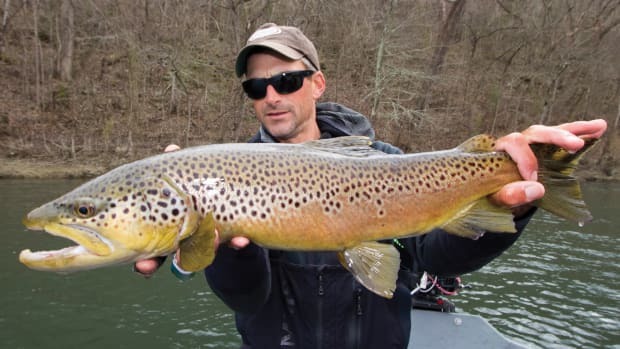 We’ve fished a long time and certainly understand that although you can pick the best dates from an historic standpoint, current conditions always play a huge part in your success. We continued to fish hard, never letting our disappointment show, but I know Betts felt bad, given the significance of the trip. After we landed only one steelhead on day two, he planned to send us farther north with one of his other guides to mine the Manistee River on day three. Wednesday morning began with renewed hopes as we met up with our new guide, Chad Schaub. It was a long drive north to the Manistee, so we were excited to see a couple of steelhead roll just across from the boat launch as Schaub parked his truck. After making a few casts into our first pool, I was firmly into a large and feisty specimen. It was a great start, but we failed to garner so much as another strike as the morning slipped past. By noon, it was evident that the big Manistee was not the answer to our prayers. 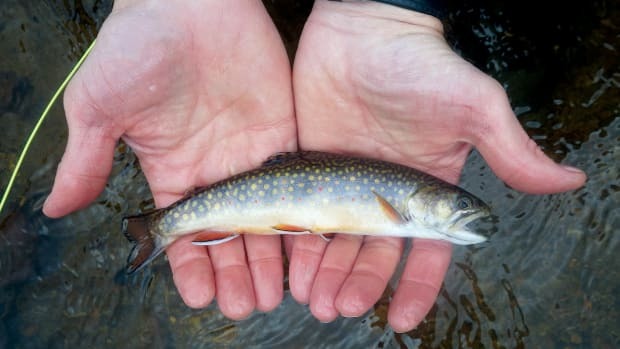 Schaub called a friend who was fishing the lower Pere Marquette River, heard all he needed to hear and loaded the boat back up for the one-hour drive. That’s when Schaub officially became our hero. It was 1:30 p.m. on Wednesday when our luck finally changed. 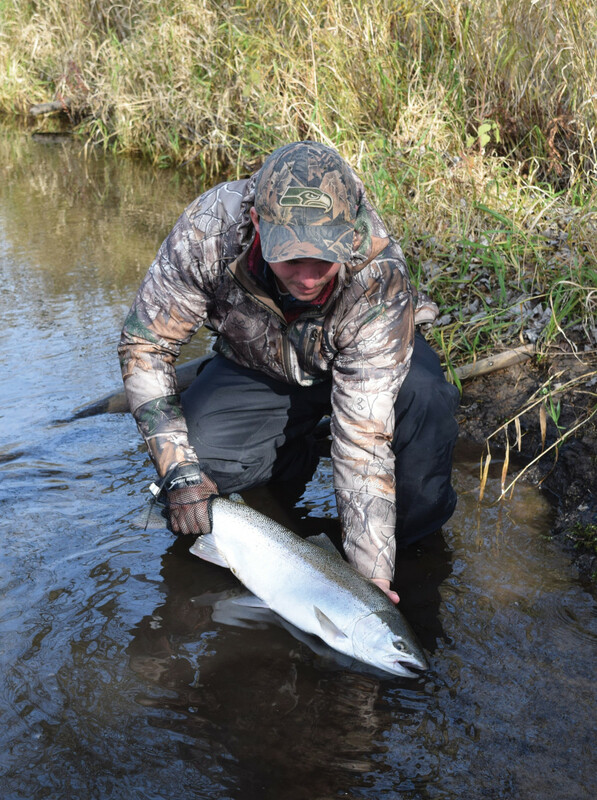 Within a couple of drifts in our first pool on the Pere Marquette, Kris Jr. hooked and landed a gorgeous chrome hen. He followed that by quickly hooking another, which he lost to an underwater branch. Because we’d launched late in the day, we pretty much had the place to ourselves, and the productive runs had adequately rested. As we moved downstream, we hooked several more steelhead before ending our day in a slow corner pool. Kris Jr. set the hook into a deep-bodied buck whose colors closely mirrored our autumn surroundings, with the perfect hint of crimson in the fish’s cheeks and flanks. I missed a solid strike but was gifted as another bruiser took my offering. In four short hours we hooked more steelhead — seven — than we had during the first two-and-a-half days. A lot of guides have the motto “stick and stay, make it pay,” but had Betts and Schaub shared that attitude, our trip may have gone much, much differently. We slept well that evening, knowing we still had a couple of tremendous days ahead of us. Thursday was my birthday, another great day to let our cameras capture our successes, opting for the catch-and-release of our entire catch. We enjoyed a bonanza of fantastic, nonstop action and phenomenal weather: an afternoon temperature near 60 degrees, which is nearly unheard of for late fall in Michigan. The sun was shining, the wind was nonexistent, and the fallen leaves had spread thickly under the trees along the riverbanks. The place looked as though an artist’s painting had burst to life — and the best part was I got to spend it with my son, making it my best birthday ever. My son, albeit unintentionally, also let me have the majority of success on the day. Friday brought another steelhead windfall, although Kris Jr. made it painfully apparent that my birthday was over as he put on a clinic, reaching double-digit hookups long before lunch. Although I hooked a few here and there, Kris Jr. schooled me in nearly every run. To my point: I made roughly 10 drifts through a juicy run while Schaub tied Kris Jr. a new rig after a break-off on a snag. On his first drift through the same run with the new rig, my son hooked up solidly with a line-peeling chromer. So went my morning, but how sweet it was seeing that beaming smile on his face. In so many ways, no matter how old he lives to be, he will forever remain that happy little boy catching his first big salmon. For the record, we hooked five steelhead in the first two-and-a-half days, and roughly 40 or so in the last two-and-a-half. And we made enough memories to last any lifetime. 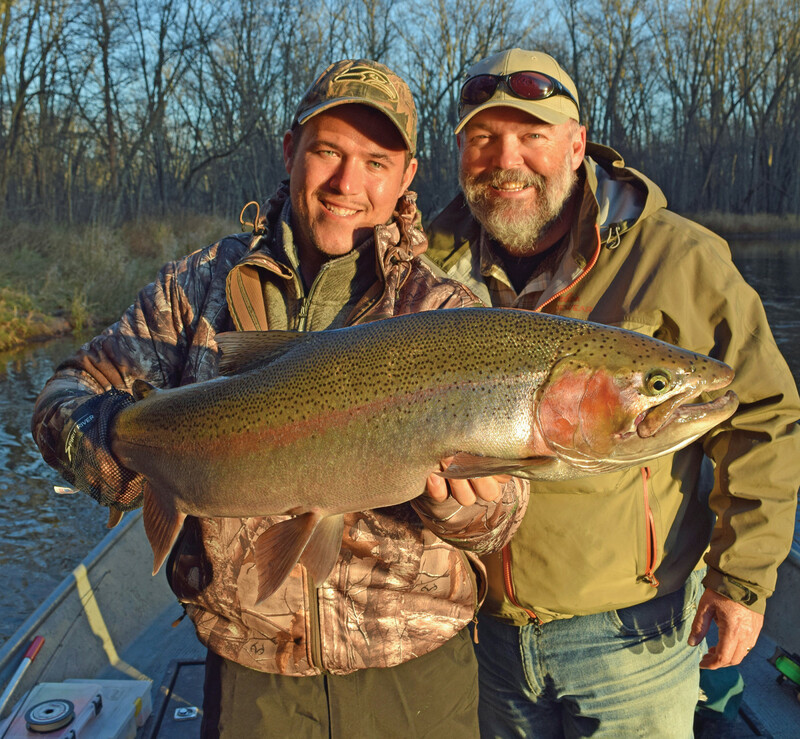 Michigan has fantastic steelhead fishing, with two distinct runs. They migrate upriver from the lake in the spring and the fall. Although I have not experienced the spring run, everyone says the numbers are stupid (meaning lots of fish), but as a result the fishery is known for being crowded. Though the fall run has fewer overall numbers of steelhead, there is far less angling pressure, and the quality of the fish is superior. Remember that each Michigan stream will at some point realize its own glory, depending on water temperatures, flows and so forth. The Pere Marquette happened to be the one on fire the week we visited. 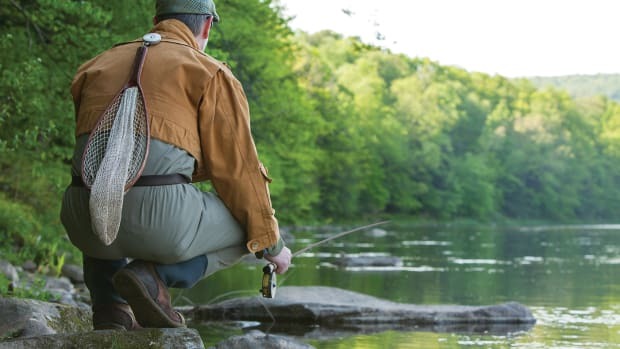 If a Michigan steelhead adventure appeals to you, Betts Guide Service in Newaygo has twice done me right. It fishes multiple rivers and techniques, and has jetboat, drift boat or walk/wade options. Give Chad Betts a call at (231) 519-7348 or check him out at bettsguideservice.com. 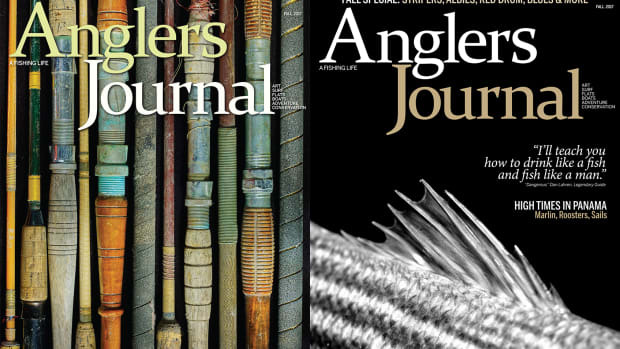 A collaboration between the author and a craftsman ended a 30-year quest to solve a hundred-year-old problem: producing a long, functional 2-weight split-cane fly rod.